Scholarship America has awarded a scholarship to Aleigha Parsons, local Subway Sandwich Artists of Cardington. 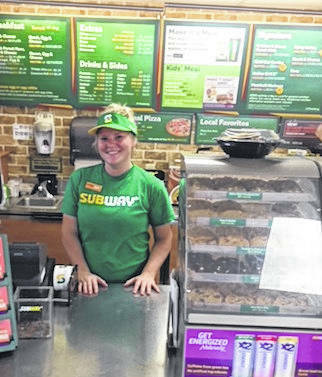 CARDINGTON — Scholarship America has awarded a scholarship to Aleigha Parsons, local Subway Sandwich Artist of Cardington, under its Subway Fresh Start Scholarship Program. Scholarships were awarded to 200 employees of Subway restaurants in United States in memory of the chain’s co-founder Fred DeLuca. Deluca opened the first Subway restaurant in August 1965 when he was a 17-year-old high school graduate looking to help fund his college education. He was given a $1,000 loan from family friend, Dr Peter Buck, and together they turned a single Bridgeport, Connecticut, sandwich shop into one of the largest brands in the world. “We are very proud of Aleigha for her pursuit of her educational goals. Aleigha has worked hard to provide our guests with great restaurant experience,” said Steve Dexter, owner of Cardington Subway. Parsons is a recent graduate of Cardington-Lincoln High School and plans to attend the University of Akron this fall. https://www.morrowcountysentinel.com/wp-content/uploads/sites/29/2018/07/web1_IMG_1328.jpgScholarship America has awarded a scholarship to Aleigha Parsons, local Subway Sandwich Artists of Cardington.